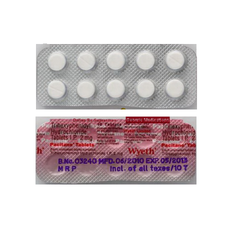 We are a leading Exporter of selegiline tablets, pramirol tablets, piribedil tablets, entacapone tablets, carbidopa levodopa tablet and syncapone tablet from New Delhi, India. Our domain expertise has enabled us to supply, import and export Selegiline Tablets. This injection is formulated under the proper guidance of dexterous professionals using optimum grade ingredients. These tablets are duly tested by quality controllers on various factors like the accurate composition and shelf life. Hallucination, drowsiness, agitation, hyperactivity, dizziness , irritability, faintness, zaw tightness, coma, seizure, fast and irregular pulse, chest pain. Before using this medication, tell your doctor or pharmacist your medical history, especially of: a certain kind of adrenal gland tumor , cerebrovascular disease , heart problems , bleeding problems, peptic ulcer, history of severe/frequent headaches, diabetes, personal/family history of mental/mood disorders , kidney disease, liver disease, overactive thyroid. 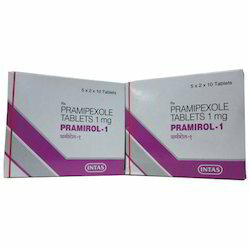 With firm commitment to the quality, we are importing and exporting a wide range of supreme quality Pramirol Tablets. Processed using high-quality ingredients. Any medication taken in excess can have serious consequences. If you suspect an overdose of Pramirol, seek immediate medical attention. There is no antidote for the overdose of this medicine; however, if the overdose is reported immediately, your doctor will treat you with certain medications that induce vomiting. Overdose symptoms may also be treated by carefully monitoring the heart, blood pressure levels, and breathing patterns. If you have an allergy to pramipexole or any other part of this drug. Tell your doctor if you are allergic to any drugs. Make sure to tell about the allergy and what signs you had. This includes telling about rash; hives; itching; shortness of breath; wheezing; a cough swelling of the face, lips, tongue, or throat; or any other signs. 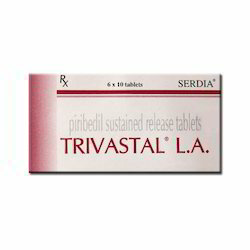 We are amongst the trusted suppliers and exporters of Piribedil Tablets. This is tested by our vendors on various parameters by quality controllers in order to deliver flawless range at the clients’ end. The speciality of these tablets is its pure and precise formulation. Large overdoses of some medications cause only minimal effects, while smaller overdoses of other medications can cause severe effects, possibly death. Entacapone Tablets using best quality ingredients and chemical compounds, these tablets are used for the treatment of Parkinson’s disease. These tablets are widely known among the clients for their longer shelf life and high effectiveness. Coma, confusion and disorientation , discolorations of skin, tongue, and urine, as well as restlessness, agitation, and aggression. 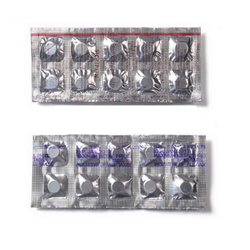 Carbidopa Levodopa Tablet is commonly used for the treatment of Parkinson’s disease and helps in controlling its symptoms such as shakiness, stiffness and difficulty in moving. Further, we offer these medicines to the clients at competitive prices. 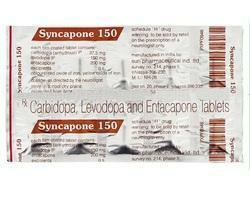 Backed by a team of efficient professionals, we are importing and exporting highly effective Syncapone Tablet. With firm commitment to the quality, we are importing and exporting a wide range of supreme quality Bromocriptine Tablets. Processed using high-quality ingredients, these tablets are used for the treatment of symptoms of hyperprolactinemia. These tablets also help in curing various other problems such as lack of menstrual periods and infertility. Nausea, constipation, sweating, pale skin, general feeling of discomfort, lack of energy, fainting, dizziness, drowsiness, confusion, hallucination, believing things that are not true. This medician should not be used or you should consult your doctor before taking it if you have any problem like blood flow problem, low blood pressure, breathing problem, gestrointenstinal bleeding, heart problem, kideny disease . 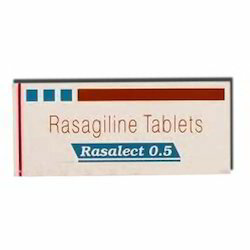 Rasagiline Tablets used for the treatment of Parkinson's disease, these tablets increase the levels of in the brain. 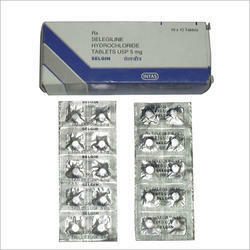 Further, we offer these tablets in various packaging capacity at competitive prices. 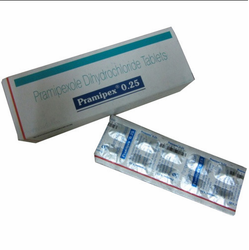 Made available by us is an effective range of Trihexyphenidyl 2mg Tablets for our customers. The tablets offered by us are procured from well-known vendors of the market who use high-quality ingredients while processing. These medicines are used for a treatment of cancer. In addition to this, we make sure that the consignments are timely delivered at clients' destinations. Symptoms of overdose with antimuscarinic agents include flushing and dryness of the skin, dilated pupils, dry mouth and tongue, tachycardia, rapid respiration, hyperpyrexia, hypertension, nausea, vomiting, rash may appear on the face, restlessness, confusion, hallucinations, paranoid and psychotic reactions, incoordination , delirium and occasionally convulsions, coma, circulatory and respiratory failure and death. This medication should not be used if you have certain medical conditions. Before using this medicine, consult your doctor or pharmacist if you have: personal or family history of glaucoma, blockage of the stomach, severe ulcerative colitis. 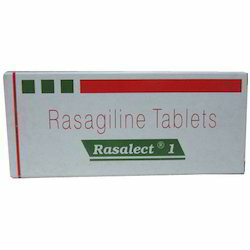 We supply, import and export an effective range of Rasalect Tablets. Agitation, coma, convulsions, cool and clammy skin, death, diaphoresis, dizziness, drowsiness, faintness, hallucinations, hyperactivity, hyperpyrexia, hypertension, hypotension, irritability, opisthotonos, orthostatic hypotension, precordial pain, rapid and irregular pulse, respiratory depression and failure, severe headache, trismus. Rasalect and other medicines used for the treatment of Parkinson`s disease has been associated with causing gambling urges. Consult your physician should this occur. 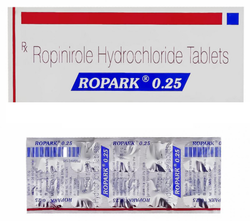 We have gained expertise in supplying, importing and exporting high-quality Ropark Tablets. These tablets are formulated using high-quality ingredients following medical industry guidelines. 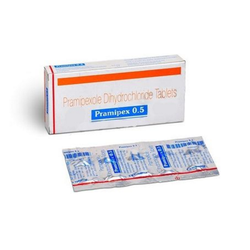 We glad to reannounced that we import and export an effective range of Pramipex Tablets 0.25mg for our clients. Our range is sourced from certified vendors of the market who use high-grade ingredients at the time of processing. These capsules score high on purity, composition and safe usage. In case of overdose tell your doctor, because it is too dangerous. Owing to our vast experience and knowledge of this domain, we are importing and exporting a broad array of Pramipexole Tablets. 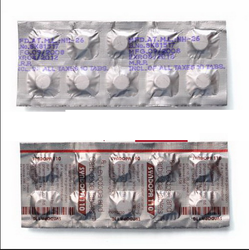 This tablet is commonly used for the treatment of symptoms and signs of Parkinson disease. Patients treated with pramipexole have reported falling asleep while engaged in activities of daily living, including the operation of motor vehicles which sometimes resulted in accidents. Although many of these patients reportedsomnolence while on pramipexole tablets, some perceived that they had no warning signs (sleep attack) such as excessive drowsiness, and believed that they were alert immediately prior to the event. Some of these events had been reported as late as one year after the initiation of treatment. Somnolence is a common occurrence in patients receiving pramipexole at doses above 1.5 mg/day (0.5 mg three times a day) for Parkinson's disease. In controlled clinical trials in RLS, patients treated with MIRAPEX tablets at doses of 0.25-0.75 mg once a day, the incidence of somnolence was 6% compared to an incidence of 3% for placebo-treated patients [see ADVERSE REACTIONS]. 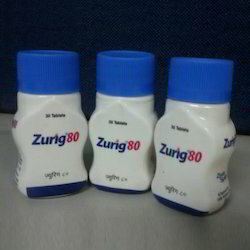 Zurig 80 works by decreasing the amount of uric acid that is produced by the body and prevents uric acid build up. The medical experts working with our vendors make use of high quality ingredients to process the offered range of medician.The medication is used as a long term treatment. We providind this medician for our clients. Stroke, heart attack, hepatitis, hypersensitivity, weight loss anaemia. Possible symptoms include difficulty breathing, difficulty swallowing, swelling, chest tightness, skin rashes, and hives.